The Consumer Electronics Giant, Toshiba has announced it is adding a new high-capacity 2.5 inch portable external hard drive to its already well-established product series of televisions, laptops and DVD players recently. Besides, the new Toshiba portable hard drive also include the 200 GB version that consider as world’s first 200GB portable storage device based on the compact 2.5-inch hard drive platform. 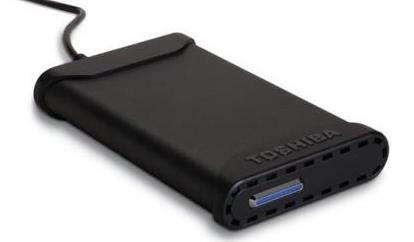 The Toshiba new external hard drive features a standard USB 2.0 connection, a highly portable 2.5-inch hard drive, and consumer-friendly set-up and operation. In addition, this Toshiba portable drive comes bundled with NTI’s Shadow software, a backup and file monitoring software package for both Intel- and PowerPC-based Macs as well as Microsoft Windows systems; once settings are chosen, plugging the drive into a USB 2.0 port will automatically power up the device and transfer data in the background without intervention. With new Toshiba USB 2.0 portable 2.5 inch portable hard drive’s click-free, switch-free and button-free backup solution, it means a worry-free lifestyle knowing that all of your important digital memories, entertainment content and life documents have been protected and backed up on this portable HDD. In addition, this Toshiba portable hard drive also features a patent-pending shock mounting that helps protect your data. Besides, it also packages with a sleek black housing coupled with a blue power-on indicator light, the Toshiba 2.0 USB External Hard Drive is a savvy complement to your notebook or desktop PC. Acording to Toshiba, the Toshiba 2.5 inch portable external hard drive comes in capacities ranging from 100 GB to 200 GB and has the largest capacity yet in a portable hard drive. Lastly, the Toshiba portable external hard drive prices range from 100GB ($129.99) to 200GB ($229.99).